Fishing Equipment The best light, medium and heavy fishing tackle--Penn Internationals and graphite rods. 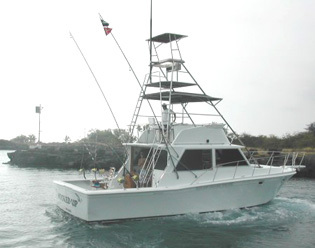 All the comforts of a modern, first-class sportfishing boat. We specialize in catching fish and making sure you have a great time doing it. We will even arrange to have your catch cooked a Pancho and Lefty's Restaurant! The fish usually belong to the boat, but we will cut your fish under 50 lbs for you.